The first day covers core skills in all three disciplines. On the next two days there are Bikeability level 2 and 3 sessions in the mornings. In the afternoons the group ride out to a BMX track and to a local Forestry Commission site for MTB. 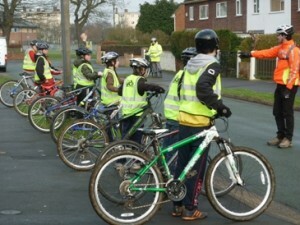 The first Tri cycling course was run in October 2010 as part of our successful “Love Your Bike” month. Everyone involved was enthusiastic; the only thing the trainees said we should change was to make the course longer. A second course was arranged for February and quickly got booked up. This time a number of young people took part from a local Barnardo’s project. - Giving our Bikeability trainers and Community Cycling Coach a chance to work more closely together and share ideas. - Showing that different situations need different skills– you can’t ride on the road as if you were on a BMX track. - Including young people with special needs in a mainstream activity. This course could be adapted to other formats eg an after-school club, or for other groups eg Scouts. We now have a waiting list so hope we get the chance to develop it further and run more courses in future. This entry was posted on Wednesday, March 2nd, 2011 at 4:15 pm	and is filed under Scheme of the month. You can follow any responses to this entry through the RSS 2.0 feed.